Team member Võ Văn Quốc said the students conducted a survey of the elderly with joint or bone disease and patients who had lost movement due to accidents who were patients at two Danang hospitals. Quốc said the patients’ families had to stay with them at all times to monitor their situation and help them move. The smart mattress, which allows patients to move without assistance, meets quality standards. The Industrial University of Ho Chi Minh City won two awards, one for a remote garden system that can be managed via an internet connection and another for a SmartPlan project. 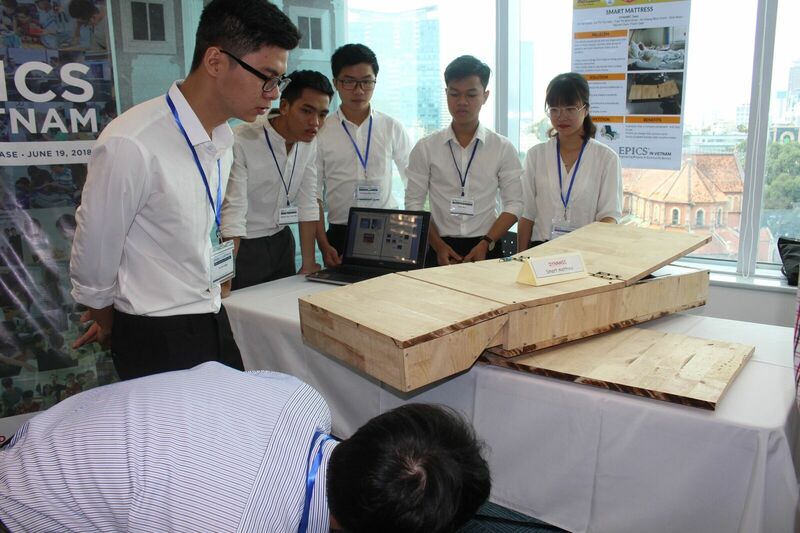 The Engineering Projects Community Service Program in Vietnam was launched by USAID’s Building University-Industry Learning and Development through Innovation and Technology Alliance, Arizona State University and Dow Chemical Company. The program is an internationally recognized multidisciplinary, social entrepreneurship challenge that helps students from fields of science, technology, engineering and mathematics develop a collaborative mindset and technical skills to brainstorm, design, prototype and test their engineering-based solutions for local challenges. Four universities were selected to pilot the program, including Danang University of Science and Technology, Ho Chi Minh City University of Technology, Industrial University of Ho Chi Minh City, and Lạc Hồng University in Đồng Nai Province.